Things are heating up behind the scenes of EATS PHILLY: Two Kitchens/Two Countries as 12 of the tri-state area’s premier chefs sharpen their knives for a night of philanthropic fun on Tuesday, April 23. The follow-up to 2011’s inaugural street food festival, this year’s event kicks it up a notch with a new location, a new charitable partner, Children’s Village, and two James Beard Foundation Award semifinalists. For anyone dying to get inside Vie (600 N. Broad St., Philadelphia), one of Philly’s trendiest party spots, this is your chance. A nonprofit cause launched by Moon Krapugthong (Chabaa Thai; Yanako) and Judy Spielman (Space by Spielman, Ltd.), EATS (Eat Along the Street) unites high-profile chefs, food media and mobile eateries for a friendly culinary competition benefiting children here in Philadelphia and in Thailand, where Chef Moon was born and raised.This year’s proceeds will go toward much-needed kitchen renovations at both Children’s Village, located here in Philadelphia, and Wat Bodd Voraditth orphanage in Thailand. The Philadelphia Mobile Food Association (PMFA) is also partnering with EATS, affording attendees the chance to sample homegrown street food from Nomad Pizza, Gozen Yogurt, The Sunflower Truck Stop and a handful of other Philly favorites. The main attraction of the evening is a Chef Throwdown, where a dozen high-profile chefs will battle to create the tastiest street food of the night. Among the talented pool of chefs are James Beard nominees Greg Vernick (Vernick Food & Drink) and Sylva Senat (Tashan), Aimee Olexy (Talula’s Table and Talula’s Garden), Rich Landau (Vedge), Top Chef’s Chaz Brown, and Tony Clark, who will be defending his 2011 title. For easy viewing of the competition, cameras will capture close-up shots of food prep, cooking, and of course, smack talk. NBC10 Reporter Tim Furlong, the evening’s emcee, will give guests the play-by-play. Judges are: chef/author Aliza Green, Maureen Fitzgerald (Philadelphia Inquirer food editor), Mary Bigham (owner, The Town Dish), Michael Klein, editor/producer of Philly.com/FOOD, and Chef Wilhelmina Bell (Children’s Village). Visit EATSPhilly.com for a full list of chefs and food trucks, as well as all event and venue details. 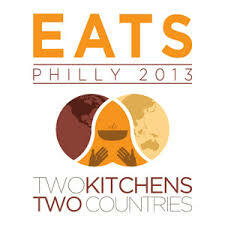 Please follow us online at EATSPhilly and @EATSPhilly.